Absolutely! It’s never too early to begin healthy living without nervous system interference. 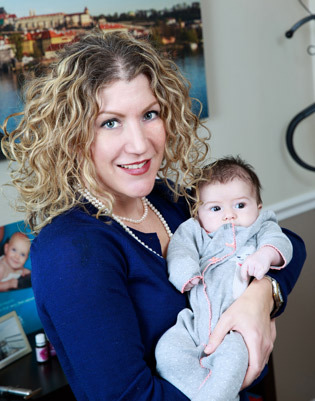 Dr. Cortney‘s youngest patients have been just moments old. She’s adjusted newborn infants just after birth, both in the hospital and following home deliveries. An infant cannot tell you what’s wrong, or even that they are in pain or not feeling well. They have no way of conveying that their spitting up is connected to heartburn, or that they are cranky because they don’t sleep well at night or aren’t eating well. At Structure Integrative Healthcare we understand that babies develop and change rapidly. It’s a good idea, therefore, to have their spine and nervous functioning checked for precisely that reason. Chiropractic philosophy is all about removing nerve interference so the body can perform at its highest, most optimal functional capacity. Think of a garden hose with a kink in it. Water cannot flow freely, and so less comes out the nozzle and pressure is increased in the hose. Our spines house the spinal cord, which is the center of all nervous system functioning in the body. When there is a “kink” in the spine, flow is affected. Adjusting the vertebral bodies decompresses the spinal cord, which decompresses the nerves and allows every organ, tissue and muscle in the body to receive the right amount of information from the brain and work properly. Whether it’s the heart muscle, a bicep muscle, your stomach or the esophagus, any part of your body can be affected by interference in the nervous system. That interference needs to be corrected to restore full function. Babies and children can be adjusted with the same premise as adults; that is making sure each end organ, tissue and muscle are getting all the information it needs from the brain, at all times. We approach pediatric and infant adjustments with a very soft touch. In most cases, your infant won’t even realize their spine is being adjusted. Imagine the amount of pressure you need to apply in order to hold a piece of paper between your thumb and forefinger. That’s about how little pressure Dr. Cortney needs to exert in order to specifically correct a misaligned vertebra in your infant’s spine. In addition to chiropractic adjustment, Dr. Cortney also performs gentle and effective soft tissue work on infants and children. This makes adjustments easier, helps them hold longer, and addresses other structural concerns in the body. Will My Kids Enjoy Chiropractic? While chiropractic care cannot cure ADD, ADHD, Autism, or other conditions where the nervous system is out of balance, it can help to balance the sympathetic and parasympathetic components of the nervous system and bring relief and significant help in management of symptoms.